Intaglio print with chine collé. Altogether, nine 4x3 inch plates were used to create this print. Three plates contained etched images: of a dark, abstract landscape, a particle physics diagram, and a pale gray feather. Japanese paper with prominent strands of kozo fiber is applied by chine collé. 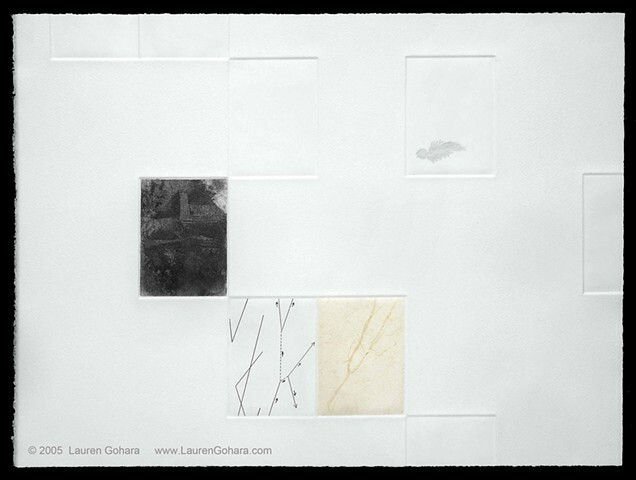 The debossed marks of five blank plates reinforce the grid, framing the physicality of the paper itself.